Snaillad (Andrew Tate) has again shown us his exceptional design skills with the headquarters for the Astrid and Associates Architecture firm. The 1930’s building has been renovated inside and out to showcase the architectural firm’s skills. Judging by the results, I expect they will have plenty of new clients to keep them busy! My favourite detail on the outside is the way that the ground floor windows on the left have been framed by the arches, followed by the tall window above the entrance. The interior features a modern decor, with a funky meeting table and clever storage for all the architectural drawings. Head over to the Flickr album for more shots of this beautiful building. Thanks for the inspiration, Snaillad! 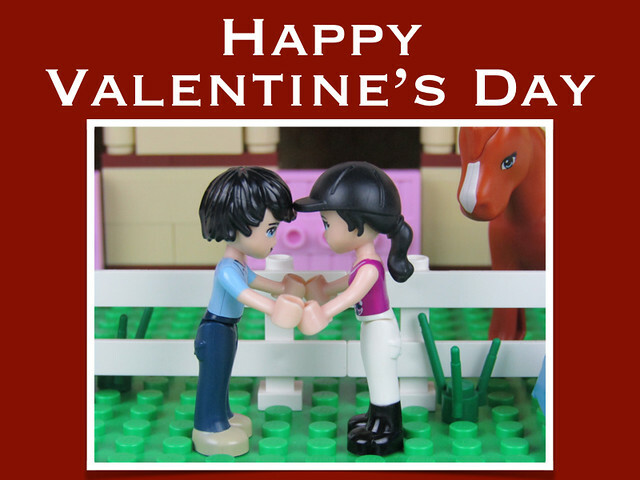 Hope everyone gets to spend some quality time with their loved ones today! 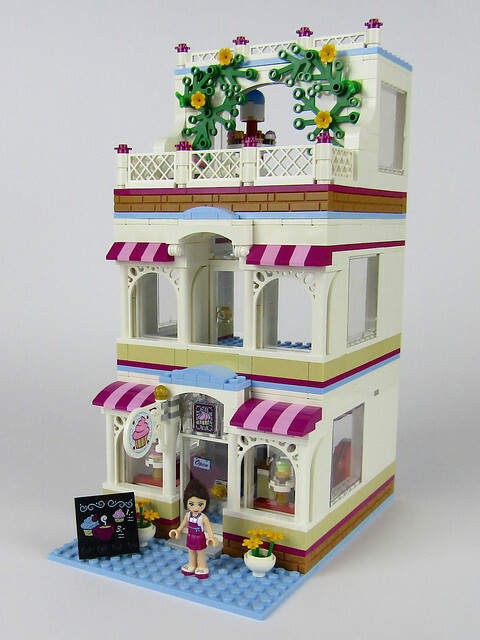 I did a review of Heartlake Cupcake Cafe (41119) for Friends Bricks back in April 2016. At that time, I had a fairly clear vision of what the modular version would look like. It’s only taken 10 months to finally get around to turning the vision into an actual building! I’ve called this one Naomi’s Place, since Naomi runs the cafe. I loved the entrance for the Heartlake Cupcake Cafe, especially the stained glass window above the front door and the windows framed using the ornamental arches. This section of the building was 16 studs wide and was therefore a natural starting point for the conversion to a modular building. There was the matter of the gaps on the sides of the arches, but I filled those using a technique similar to that used by LEGO in the Winter Village Toy Shop (10199). I also loved the outdoor seating area and was able to incorporate a similar structure in the rooftop terrace. My daughter also decided that this was the perfect place for the rotating cake display. So, while it lost the round windows, it didn’t lose the whole display! The ground floor and rooftop are furnished with the fittings from the official model. The first floor remain empty, but this could readily be converted to more seating (maybe move the couch there?) or the bakery / kitchen for the cafe. You can find more images of Naomi’s Place on flickr and you can download the instructions for the structure here. I don’t normally showcase other building scales, but I couldn’t go passed these Mini Modulars by de-marco. The level of detail that de-marco has captured in these four buildings is awe-worthy. My favourite is the bank, followed closely by the second from the left, which I’m guessing is a townhouse. Although small in scale, de-marco has made the bank look like a grand building with an imposing entrance. I also love the shop front on the bakery. What’s your favourite? Head over to the Flickr album for a closer look at these pint-sized perfections! Designed to celebrate the 10th anniversary of modular buildings by LEGO, Assembly Square (10255) stands out in terms of design, size and parts selection. Let’s take a closer look why. carebear has created stunning corner modular building to provide a garage, storage area and general workshop for his museum. The Garage features a striking facade and three fully furnished floors for parking museum vehicles, storing artefacts and museum staff to prepare, maintain and repair museum exhibits. The Garage is as beautifully done on the inside as it is on the outside, so make sure to check out the whole building in high-resolution on Brickshelf, and then head over to Eurobricks to join the conversation about this stunning building. Thanks for the inspiration carebear! Eliza (Elizabeth Nevermind) has hit all the high notes with the four storey Music Store. Dark Red and Dark Blusih Grey are one of my favourite combinations for modular buildings. Eliza has taken this a step further, with depth in the facade created by the colour and texture variation in the brick work. I love the details on the cornices, especially the use of the bow and arrow pieces and the 1×2 Technic bricks on their side. Other details that caught my eye were the fire escape on the side of the building and the “Music” sign. On the inside, the ground floor of the Music Store has a range of instruments on display. My favourite details are the keyboards and the bongo drums. Head over to Eliza’s Flickr photostream to see more images of the impressive Music Store. Sebastian Zaberca shows us what happens when plants go bad, with the Botanical Institute being overtaken by carnivorous vines. Fortunately, the plants haven’t yet destroyed the property, so we still get to admire the beautiful building that houses the institute. Thanks, as always, for the inspiration, Sebastian! LEGO is holding a contest to celebrate the 10th Anniversary of modular buildings. The prize list is truly drool-worthy, with no less than six modular buildings for the grand prize! Head over to Rebrick now to check out what you need to do to be in the running. Zara is one of my favourite places to shop, so it was no surprise that the Zara Clothes Shop by Alex (Olympio Albano) caught my attention. The massive Zara store is spread over three levels, but you don’t need to worry about lugging all that shopping from one floor to the next, as there is a (manually operated) lift to take you from floor to floor! There are plenty of details to catch your attention, so head over to the Flickr album to check them all out.